LAWRENCE — The University of Kansas School of Engineering will hold its dedication ceremony for Learned Engineering Expansion Phase 2 (LEEP2) at 4 p.m. Friday, Oct. 30, on the lawn of the engineering complex. Chancellor Bernadette Gray-Little will be among the highlighted speakers, as well as David Murfin from the Kansas Board of Regents and Greg Graves, CEO and president of Burns & McDonnell. Seamlessly integrating with Learned Hall, Spahr Library and the Measurement, Materials and Sustainable Environment Center, LEEP2 adds more than 135,000 square feet to KU’s engineering facilities. The building features six active-learning classrooms, a café, teaching and research labs, a remodeled library and numerous new collaboration and study spaces. LEEP2 also houses the School of Engineering’s new Student Success Suite, which includes academic services, recruitment and retention operations, and offices for minority programs and women’s programs. LEEP2 is also home to the Engineering Career Center. The six active-learning classrooms are one of the facility’s crucial innovative features designed to enhance the student experience. In lieu of a traditional lecture hall setup, students in the active-learning environment sit in small groups at a table with its own monitor and audio-visual system. An instructor and team of teaching assistants present problems for discussion. Students collaborate at their tables to solve the problems. Each group can use the a/v setup to share their solutions with the entire class. This format allows students to watch a professor’s recorded lectures at home and spend classtime doing hands-on problem-solving in teams with the help of their instructors. Another feature of LEEP2 is the numerous new study and collaboration spaces. In Learned and Eaton halls, students have limited space to sit in groups and work together. LEEP2 offers tables and chairs in the atrium area, along the halls and in alcoves on each floor, as well as reservable study rooms for students to work together. These collaboration spaces have white board paint on the walls so that students can write directly on the walls with dry-erase makers to solve problems and work together. “If you walk down the hallway in Learned, there was never anybody there because there was never any place to sit. This building has been designed with plenty of space for students to get together and work together,” Parsons said. 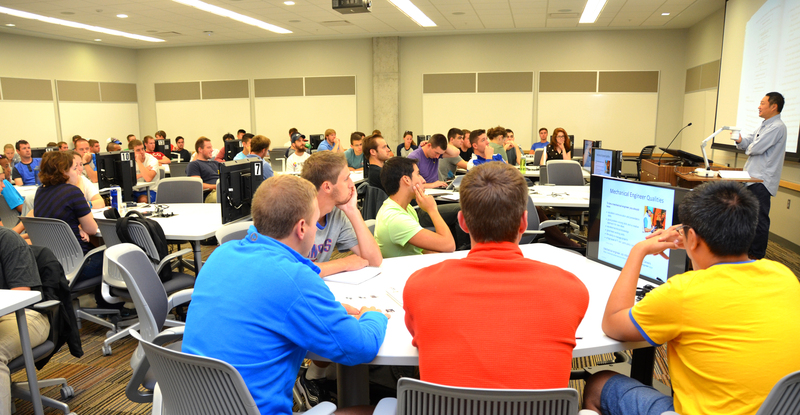 In response to the increasing needs for more engineers in the workforce in Kansas and the region, the Kansas Legislature passed the University Engineering Initiative Act in 2011. The legislation paved the way for KU to expand its facilities, add faculty positions and increase enrollment. LEEP2 features several spaces and enhancements made possible by individual and corporate donors. •The LEEP2 Atrium will be named the McClendon Atrium thanks to the generosity of Brian and Beth Ellyn McClendon. The space is dedicated to Brian McClendon, 1986 KU electrical engineering graduate, co-creator of Google Earth and 2015 inductee to the National Academy of Engineering. •The ExxonMobil Student Success Suite is named in recognition of the ExxonMobil Foundation, ExxonMobil employees and retirees in the Jayhawk family. •The Koch Unit Operations Laboratory was made possible by 1969 chemical engineering Kyle Vann, retired CEO of Entergy-Koch and Koch-Glitsch. •The Textron Aviation Aerospace Engineering Design Laboratory was made possible by Textron Aviation. LEEP2’s atrium also features art designed by KU architecture student Perry May. The piece, “Structural Evolution,” is a stylized piece of DNA that hangs from the ceiling. The sculpture weighs nearly 2,000 pounds, is 35 feet long and 8 feet wide. It was fabricated and donated by A. Zahner Co., which is led by 1978 KU School of Engineering graduate L. William Zahner. As part of the expansion project, the new Structural Testing and Student Projects Facility on KU’s West District houses dedicated student, faculty and graduate research space as well as a 40-foot high strong wall. This world-class structure allows students to perform real-life structural tests rather than scaling them for smaller labs. The facility also includes dedicated space for senior design labs, student groups and clubs. Mechanical engineering seniors have been the first groups to use the new facility on west campus.